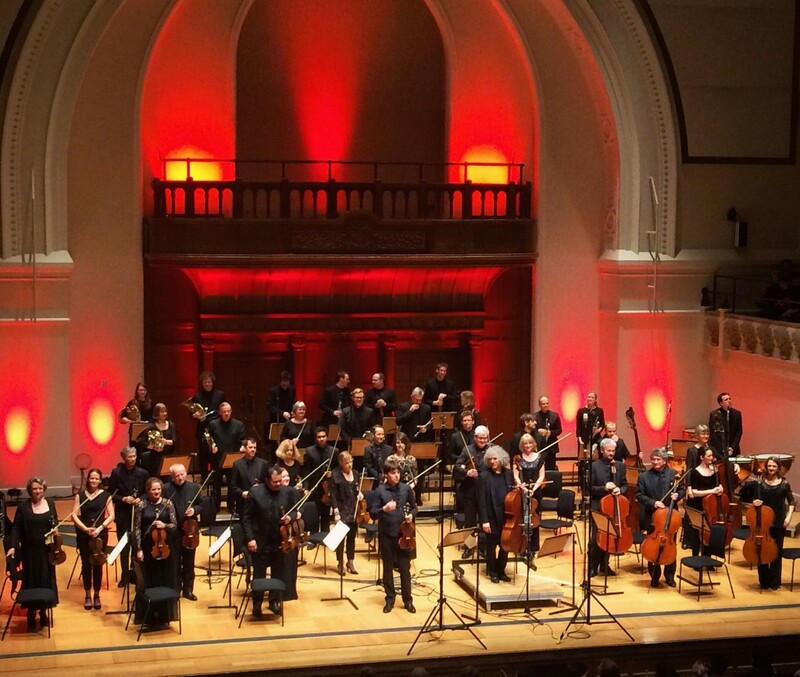 Joshua Bell & Steven Isserlis @ The Cadogan Hall (22.01.16) | WhatsTheScene? Steven Isserlis (cello) and Joshua Bell (violin) entered a sold-out Cadogan Hall yesterday, accompanied by players from the Academy of St Martin-in-the-Fields. The ensemble has been touring throughout January across Europe, performing at venues from Dusseldorf to Edinburgh. Bell and Isserlis’s friendship spans thirty years of collaborations and performances, and the pair have been eager to tour together for many years. This month, their ambition has been realised. Isserlis opened the concert with a profound, elegant rendition of Dvořak’s ‘Waldesruhe’ (‘Silent Woods’). In his most recent blog post (‘The Dangers of Redundant Beauty’) he describes how a musician should choose to create “meaningful voices telling truthful tales” over a monotonously “beautiful version”. Last night the organic tone of his gut strings (which he famously advocates) exemplified this. An unusually serene, lyrical choice for an opening number, the work welcomed Isserlis’s rich, raw sound, particularly during the turbulent central section. It was a dreamlike opening to a first half otherwise packed with Beethovenian strength, power and prowess. Bell, Musical Director of the Academy since 2011, sat as Principal of the Academy orchestra whose conductorless feature has become something of a trademark. Beethoven’s ‘Symphony No. 8′ proved a revealing showcase for the unusual approach, which demands the highest level of engagement and awareness from every player. The result was an amazingly unified orchestra, with Bell’s leadership emanating waves of contagious energy. However the multiple demands as principle violinist and conductor meant his movements were at times distractingly flamboyant. The musical subtleties a regular conductor would provide were also lost (Bell couldn’t exactly give cues whilst playing). As a result exposed corners in the work suffered from tentativeness, in particular at the opening of the ‘Allegro Vivace’. Here the first violins introduce the initial series of delicate entries, and Bell couldn’t indicate the downbeat and play simultaneously. The result was a rather hesitant start to an otherwise bold and jovial finale. Opening the second half, Bell’s interpretation of Schumann’s ‘Langsam’ (‘slow’) movement was elegant, poised and deeply felt. The performance had a stunning emotive potency, with beautifully subtle interactions between soloist and Isserlis’s soulful counter-melody. Bell describes the work as “one of the most beautiful melodies in the violin repertoire” which is “greatly underappreciated” and that’s no understatement (I’ve had it looped all morning). By the time we reached the programme’s centerpiece, the Cadogan Hall was ripe with anticipation. The Bell-Isserlis rendition of the ‘Brahms Double‘ is far from unknown territory for either musician, though you would never have guessed. The pair dovetailed in and out of each other’s lines with a sound that was earnest, fresh and gutsy. The strength of Isserlis’s lower range stole the show from the start: opening the initial solo cadenza with a rich, growling descent into the depths of his Stradivarius. Of the three movements, the ‘Andante’ was perhaps slightly weaker than the other two, as the soloists’ interpretations differed a little and jarred each other. However on the whole, the pair exhibited an acute awareness of one another’s playing. In the concerto format, Bell’s conductor-style leadership greatly benefitted the performance. His dance-like movements encouraged a natural, receptive manner throughout the ensemble, breaking down the barrier between soloists and orchestra. Overall, the Academy proved last night that the style can work. However it owed its success to the professionalism and skill of the players, which – excluding the occasional weak horn entry – was faultless. This musicianship stood out as the ensemble’s greatest asset, and the pleasure each player took from their performance was clear. Rarely do you find a group of classical professionals whose love of the performance is so tangible. Bell, Isserlis and the Academy know they’ve found a magic formula, and it spells S-W-A-G.